Janet and I are watching the current situation in Israel very closely and are in constant contact with all our contacts in Israel and the West Bank. We just returned a week ago from a marvelous pilgrimage and we are taking the Legatus group to the Holy Land in October of this year. The map shows where we will tour with Legatus (black circles) and the areas where the fighting is taking place now (red circles). 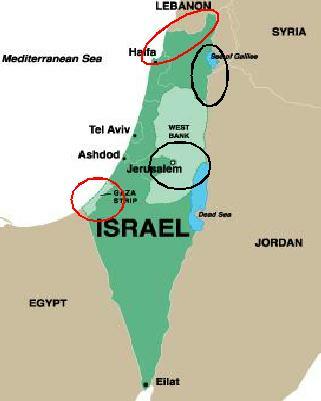 The lower red circle is Gaza and the upper red circle is the north border of Israel above which is Lebanon and the Hezbollah. With the exception of of a few rockets that have landed in Tiberias, the areas we will visit during our October trip are not within the area where the fighting is currently taking place. Between now and then we anticipate the hostilities will subside, but even if they don't, the areas we will visit are not in involved in the current situation. We will still go on pilgrimage because the areas we visit are safe and because we want to continue supporting Israel and our brothers and sisters in Christ. We expect the fighting will be over long before it is time for us to go in October. We would never take pilgrims to any areas where they would be in danger. If anyone going on pilgrimage with us has any questions, I keep our Safety page updated on our Pilgrimage website at www.FootprintsOfGodPilgrimages.com and you can write me at sray@me.com.